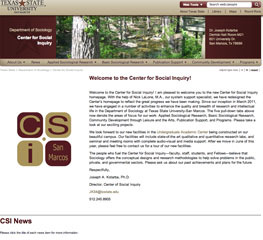 The Department of Sociology at Texas State University-San Marcos established the Center for Social Inquiry in March 2011. We have engaged in a number of activities to enhance the quality and breadth of research and intellectual life in the Department. Our activities have focused on five areas. Applied Sociological Research includes evaluation and needs assessment projects ranging from a needs assessment study for the Human Services Board of the City of San Marcos, Texas, to a white paper policy statement on diversity for the Texas Healthcare Trustees. Basic Sociological Research projects supported by the Center include a qualitative study translational science at the University of Texas Medical Branch-Galveston, funded by the NIH. Our major project on Community Development through Leisure and the Arts is an upcoming symposium on music scenes and community development. Publication Support has been given to Baby Boomer Rock‘n’roll Fans: And the Music Plays On (Scarecrow Press), The Present and Future of Symbolic Interaction (FrancoAngeli), and The Death and Resurrection of Deviance (Palgrave). Finally, our first program to integrate university and community interests was a multi-media symposium on Tejano music star Selena. “The Culture of Translational Science Research,” funded by the Institute for Translational Science at UT Medical Branch-Galveston and the NIH. “An Evaluation and Needs Assessment of Human Services Delivery,” funded by the City of San Marcos, Texas.